Biscuits and Gravy are one of the best southern breakfasts ever. 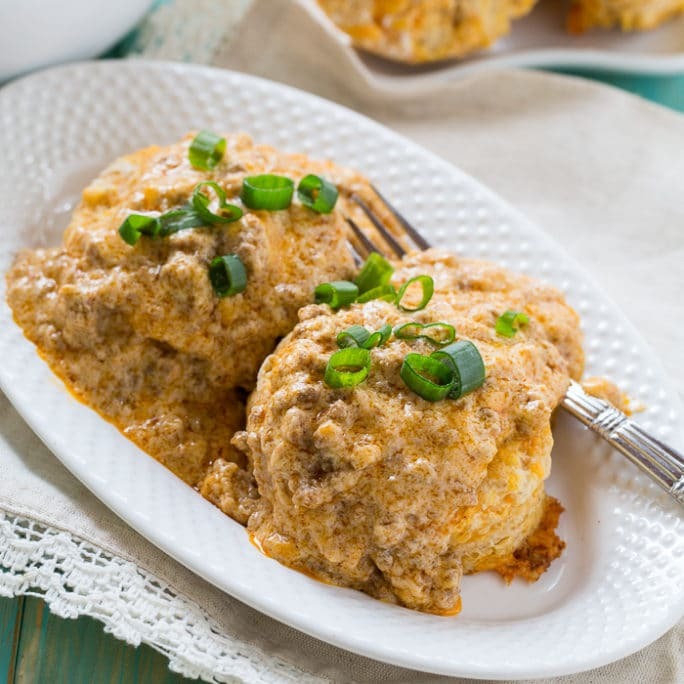 You just can’t beat a fluffy and tender biscuits covered in a rich and creamy sausage gravy. 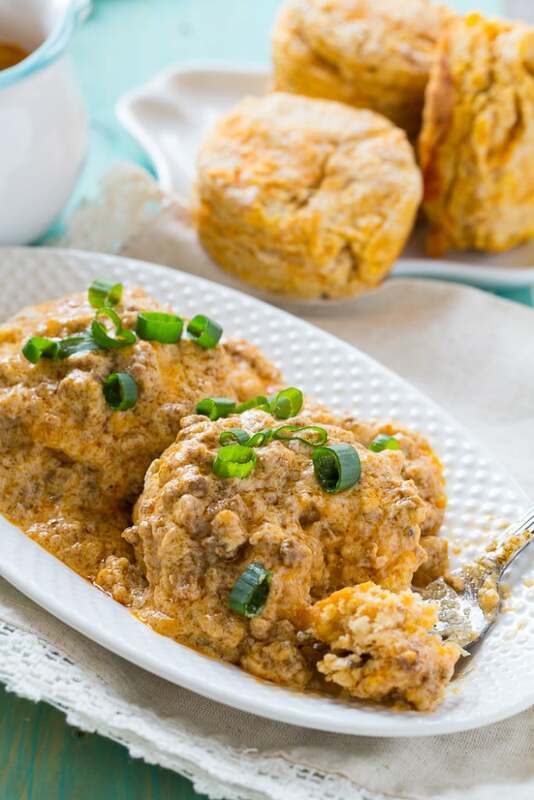 These Sweet Potato Biscuits with Chorizo Gravy are a fun twist on Biscuits and Gravy. 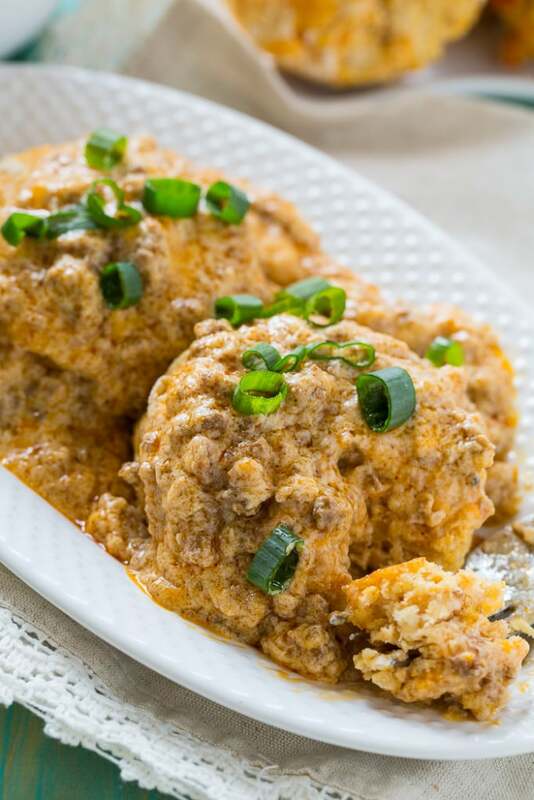 Adding a little mashed sweet potato to the biscuits gives them a beautiful orange color and a hint of sweetness which pairs wonderfully with the spicy chorizo in the gravy. Chorizo can sometimes be a little difficult to find in certain areas. I use mail-order chorizo from The Naked Pig. They have a small family farm in North Carolina where they raise pastured pigs and 100% grass-fed beef without adding hormones or antibiotics. If you are looking for superior beef and pork products check out their website. Sausage Gravy is just about the easiest thing you can make. 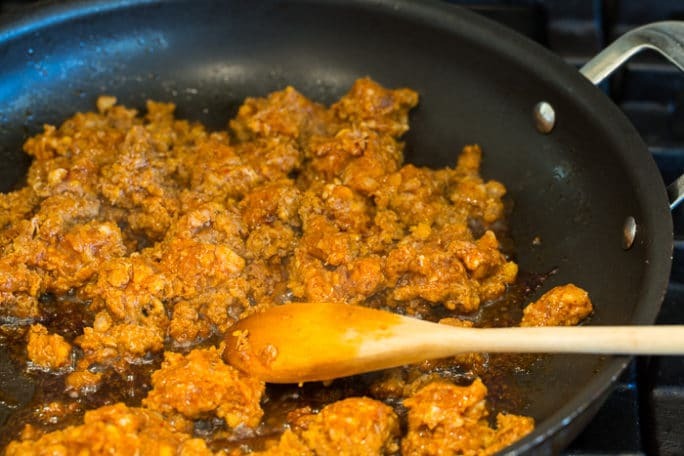 Just brown the chorizo in a pan, remove it with a slotted spoon, leaving the grease. Add butter and flour to make a roux and then mix in milk. Once thickened, add the chorizo back to the pan. 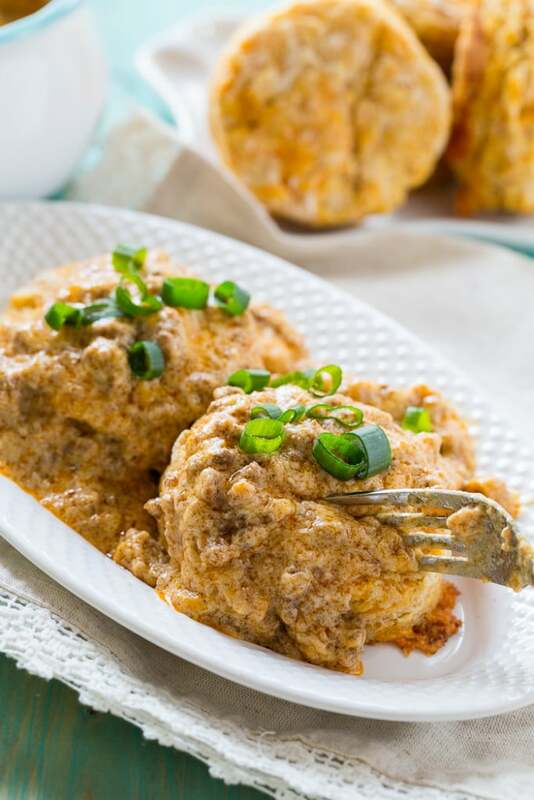 Sweet potato biscuits with a touch of sweetness paired with spicy chorizo gravy make a fantastic southern breakfast pairing. Preheat oven to 425 degrees and grease a baking sheet with butter. In a large bowl, whisk together flour, baking powder, sugar, salt, and chili powder. Scatter butter cubes across flour mixture and use a pastry cutter or your fingers to cut the butter in until there are no pieces larger than a small pea. Stir in sweet potato and cheese. Add 3/4 cup milk and stir just until flour is moistened. If it is not coming together into a dough, add a little more milk. Place dough on a lightly floured surface and roll or pat out to 1-inch thickness. 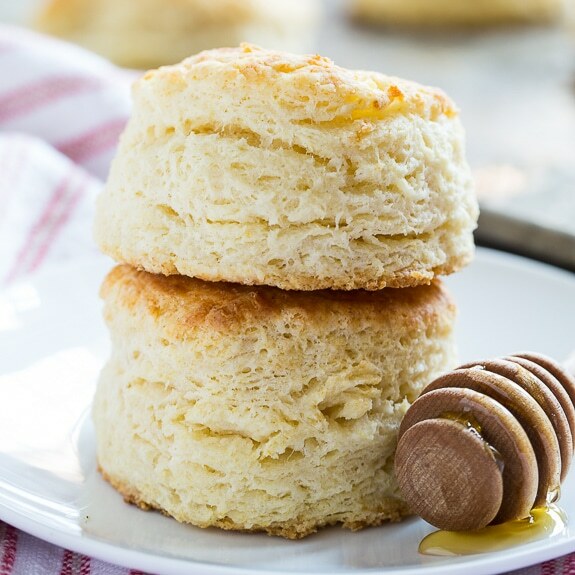 Cut into biscuits with a 2 1/2-inch biscuit cutter. Gather scraps and roll to cut more biscuits. You should get at least 8 biscuits. 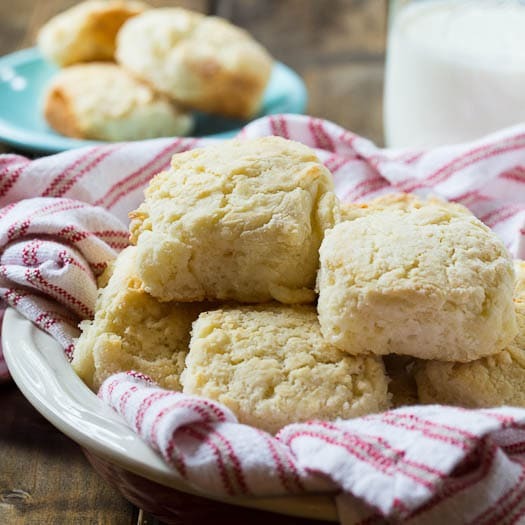 Place biscuits on prepared baking sheet and bake for 12 to 15 minutes. To make gravy, brown chorizo in a nonstick pan, breaking it apart with a wooden spoon as it cooks. Once cooked all the way, remove chorizo from pan with a slotted spoon and set aside. Leave grease in pan and add butter to it. Heat over medium heat. When butter has melted, add flour. Stir and cook for 1 minute. Gradually whisk in milk. Add pepper and cook until thickened. Return chorizo to pan. Stir to mix and keep warm until ready to eat. This entry was posted in Breakfast and tagged biscuits, Pork, sweet potato. Bookmark the permalink. Just made this dish. Best biscuits and gravy dish I’ve ever had!!! Easy enough to make too!! That’s so great to hear Brock! Oh I love the sound of this dish! Biscuits and gravy are a favorite of mine, so turning them into sweet potato ones with chorizo gravy sounds amazing! Savory is always my preferred way to start the day! This is all sorts of delicious! Oh I love biscuits and gravy! 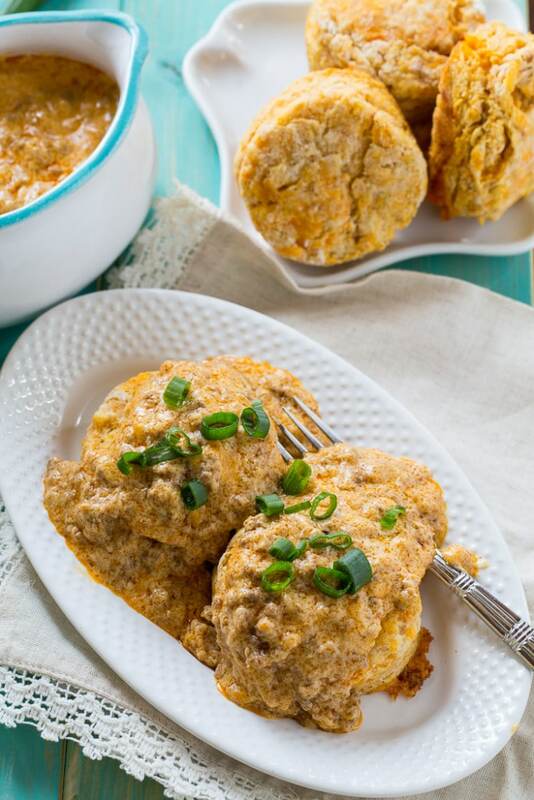 And these sweet potato biscuits with that chorizo gravy just takes it to a whole new level. Love it! Pinning! I absolutely love biscuits and gravy! This is such a fun spin on the classic, that chorizo gravy sounds incredible!